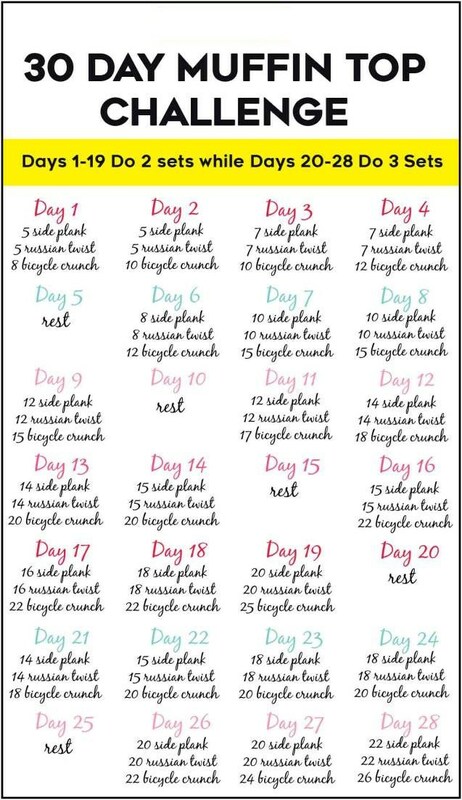 The 30-days muffin top challenge will provide you amazing results in only one month and the only thing you will regret is why you haven’t tried this earlier. The 30-days challenge consists of only three types of exercises, so you will not face certain difficult movements. The side plank exercise is a brilliant way to build core strength in a way that targets one of the common weak zones. Try to stay in this body for 20-40 seconds and then you may return your body to the starting position. Following is the 30-days muffin calendar and the exact order which day what you will need to perform. Days 1-19 you will have to do 2 sets of each exercise, while days 20-28 3 sets of each exercise. Apart from working out, there are other factors that you should take in consideration. We going to stress few in this article. Sodas are abundant in sugars and there are one of the main reasons for excess pounds. Instead of soda consume plenty of water which will help you hydrate your body and help you built a muscle mass. An unhealthy diet is definitely the main reason for excess fat. Instead of any processed food try to include more vegetables and lean meat in your daily diet. If your hormones are out of the balance this means that they will cause certain problems to your waistline. For instance, the insulin is one of the greatest reasons for the appearance of the muffin top on your stomach. Cardio workout is essential for burning fat, therefore try to run at least couple of times a week to sweat out the toxins from the body and burn fat. In order for your muscles to repair, you have to rest your body properly. Sleep around 7-8 hours a night to wake up fresh and ready for the next day.